1. Radial or disc cam: In radial cams, the follower reciprocates or oscillates in a direction perpendicular to the cam axis. The cams as shown in above Fig. are all radial cams. 2. Cylindrical cam: In cylindrical cams, the follower reciprocates or oscillates in a direction parallel to the cam axis. The follower rides in a groove at its cylindrical surface. A cylindrical grooved cam with a reciprocating and an oscillating follower is shown in Fig. below (a) and (b) respectively. i. Prime circle: It is the smallest circle that can be drawn from the centre of the cam and tangent to the pitch curve. For a knife edge and a flat face follower, the prime circle and the base circle are identical. For a roller follower, the prime circle is larger than the base circle by the radius of the roller. ii. Pitch circle: It is a circle drawn from the centre of the cam through the pitch points. iii. Pressure angle: It is the angle between the direction of the follower motion and a normal to the pitch curve. This angle is very important in designing a cam profile. If the pressure angle is too large, a reciprocating follower will jam in its bearings. iv. Trace point: It is a reference point on the follower and is used to generate the pitch curve. In case of knife edge follower, the knife edge represents the trace point and the pitch curve corresponds to the cam profile. In a roller follower, the centre of the roller represents the trace point. 1. Excessive wear due to small area of contact between cam & follower surfaces. 2. In this follower a considerable thrust exists between the follower and guide. (a)Knife edge follower. When the contacting end of the follower has a sharp knife edge, it is called a knife edge follower. (b) Roller follower. When the contacting end of the follower is a roller, it is called a roller follower. (c) Flat faced or mushroom follower. When the contacting end of the follower is a perfectly flat face, it is called a flat faced follower and when the flat faced follower is circular, it is then called a mushroom follower. 2.According to the motion of the follower. (a) Reciprocating or translating follower. When the follower reciprocates in guides as the cam rotates uniformly, it is known as reciprocating or translating follower. (b) Oscillating or rotating follower. When the uniform rotary motion of the cam is converted into predetermined oscillatory motion of the follower, it is called oscillating or rotating follower. (b) Off-set follower. When the motion of the follower is along an axis away from the axis of the cam centre, it is called off-set follower. 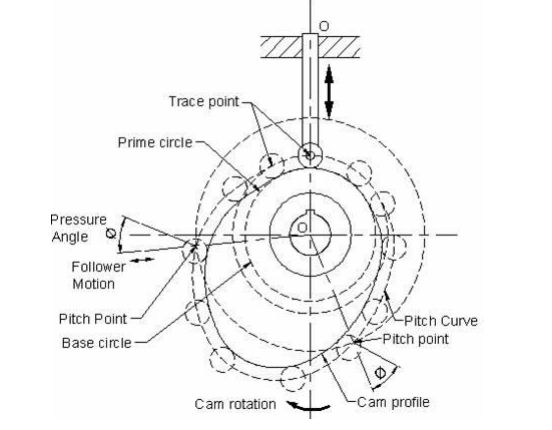 A cam with 40 mm minimum diameter rotates in clockwise at uniform speed and has to give the following motion to a roller follower 15 mm diameter : (i) Follower to complete outward stroke of 40 mm during 120o of cam rotation with uniform velocity. (ii) Follower to dwell for 60o of cam rotation. (iii) Follower will return to its initial position during 120 of cam rotation with uniform acceleration and retardation. (iv) Follower will dwell for remaining 60o of cam rotation. 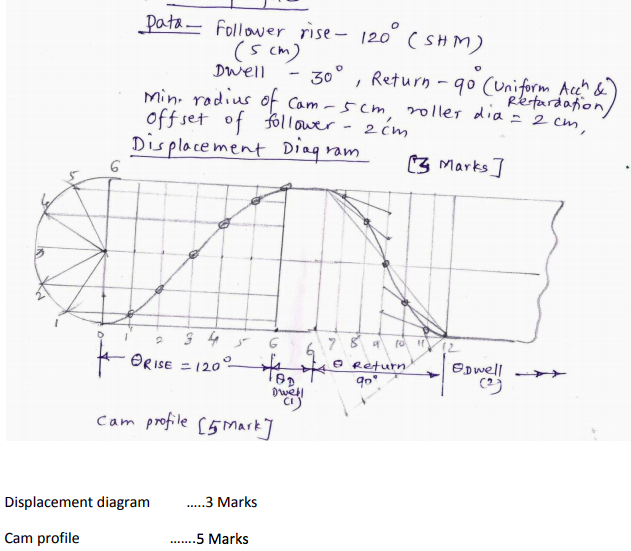 Draw the profile of cam, if the axis of follower passes through the axis of cam. 1. According to the surface in contact. (a)Knife edge follower. When the contacting end of the follower has a sharp knife edge, it is called a knife edge follower. (b) Roller follower. When the contacting end of the follower is a roller, it is called a roller follower. (c) Flat faced or mushroom follower. When the contacting end of the follower is a perfectly flat face, it is called a flat faced follower and when the flat faced follower is circular, it is then called a mushroom follower. 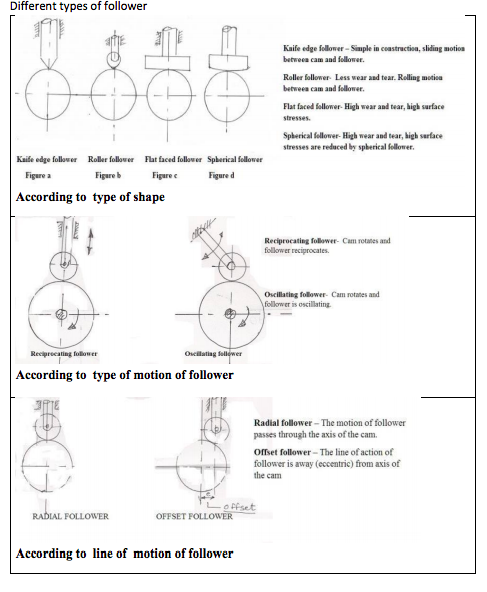 (d) Spherical faced follower. When the contacting end of the follower is of spherical shape, it is called a spherical faced follower. 2.According to the motion of the follower. (a) Reciprocating or translating follower. When the follower reciprocates in guides as the cam rotates uniformly, it is known as reciprocating or translating follower. 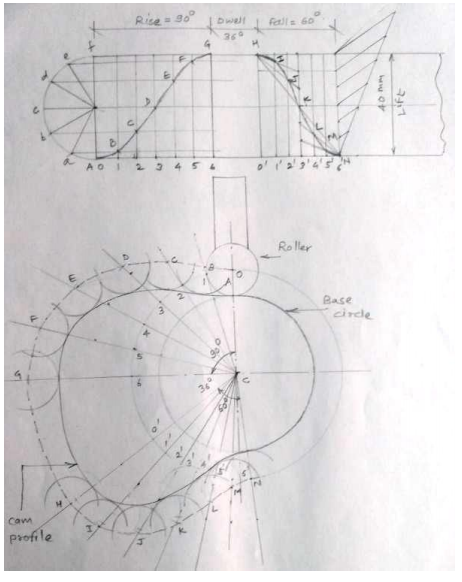 (b) Oscillating or rotating follower. When the uniform rotary motion of the cam is converted into predetermined oscillatory motion of the follower, it is called oscillating or rotating follower. 3. According to the path of motion of the follower. (a) Radial follower. When the motion of the follower is along an axis passing through the centre of the cam, it is known as radial follower (b) Off-set follower. When the motion of the follower is along an axis away from the axis of the cam centre, it is called off-set follower. Draw the profile of a cam to raise a valve with S.H.M. through 40 mm in of revolution, keep it fully raised through 1/10 th 1 th 4 revolution and to lower it with uniform acceleration and retardation in 1/6 th revolution. The valve remains closed during the rest of the revolution. The diameter of roller is 20 mm and minimum radius of cam to be 30 mm. The axis of the valve rod passes through the axis of cam shaft. 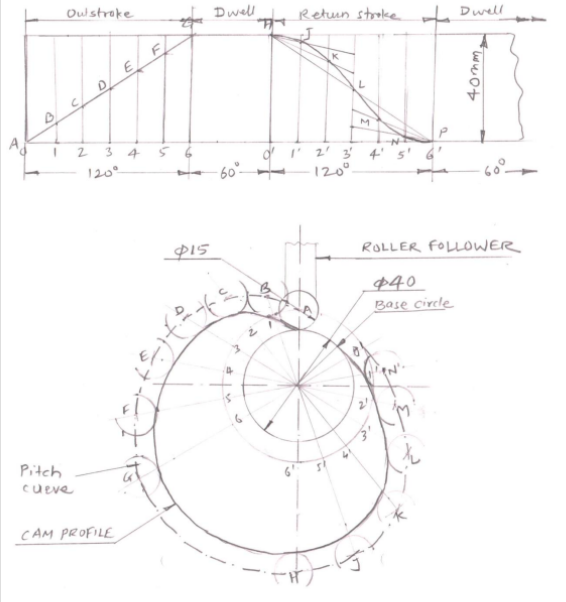 Fig shows a displacement diagram and a cam profile for the roller follower. (i) Pressure angle: It is the angle between the direction of the follower motion and a normal to the pitch curve. This angle is very important in designing a cam profile. If the pressure angel is too large, a reciprocating follower will jam in its bearing. (ii) Pitch point: It is point on pitch curve having the maximum pressure angle. 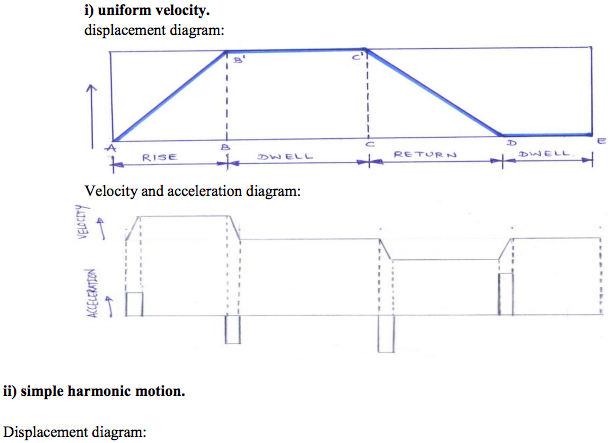 Uniform velocity, Simple harmonic motion, Uniform acceleration and retardation, Cycloidal motion. 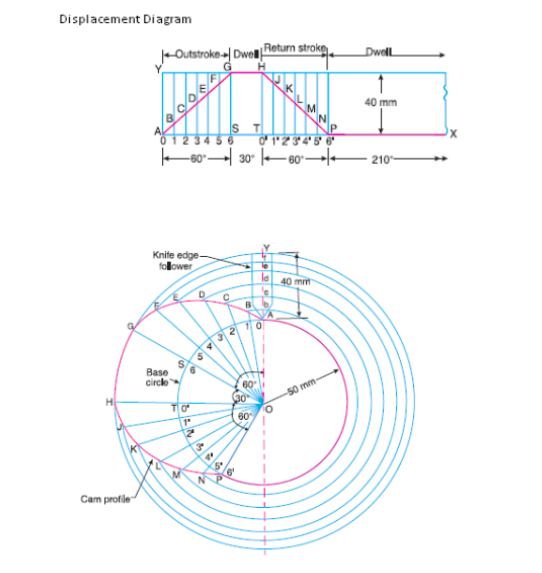 Draw the profile of cam operating a roller reciprocating follower with the following data : Minimum radius of cam = 25 mm lift = 30 mm Roller diameter = 15 mm The cam lifts the follower for 120owith SHM followed by a dwell period of 30o. Then the follower lowers down during 150o of the cam rotation with uniform acceleration and deceleration followed by a dwell period. Advantages of roller follower over knife edge follower a) Roller follower has less wear and tear than knife edge follower. b) Power required for driving the cam is less due to less frictional force between cam and follower. Draw profile of cam to raise the valve with S.H.M. through 5cm in 120° of revolution, keep it fully raised through 30° and lower it with equal uniform acceleration and retardation through 90° of rotation. The valve remain closed during the rest of rotation. The diameter of the roller is 2 cm and the minimum radius of the cam is 5cm. The axis of the valve rod is offset 2cm from the axis of the shaft. Assume the cam rotating in clockwise direction. 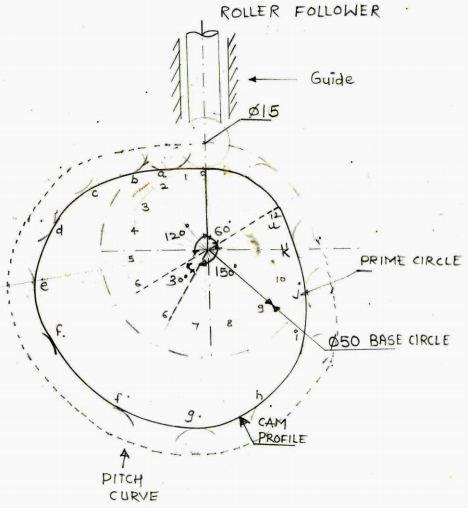 (1) Pitch circle- Circle drawn from centre of cam through pitch points. 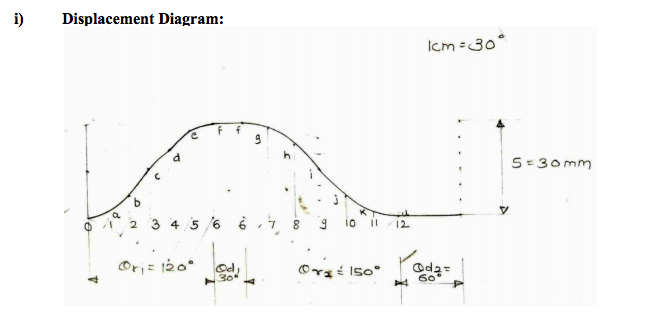 (2) Pressure angle- Angle between direction of follower motion and normal to pitch curve. (3) Stroke- Maximum travel of follower from its lowest position to top most position. 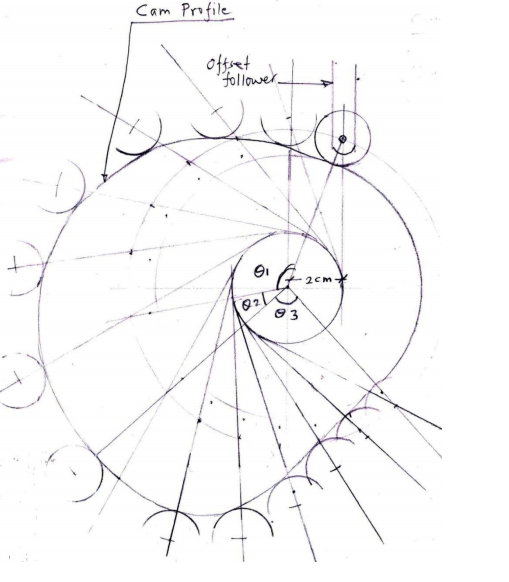 (4) Module –(Gears) – Ratio of pitch circle diameter in mm to No. of teeth on gear. 3. 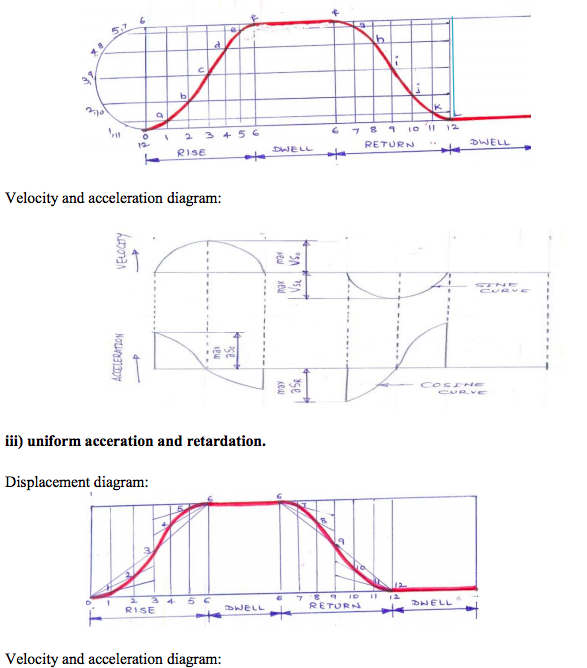 Uniform acceleration and retardation, and 4. Cycloidal motion. In case of knife edge follower there is sliding motion between the contacting surface of cam and follower. Because of small contact area, there is excessive wear; therefore it is not frequently used. Whereas in roller follower there is rolling motion between contacting surfacing and more contact area, therefore rate of wear is greatly reduced. Advantages: i) Less wear, more life ii) Less side thrust as compared to knife edge follower. Construct a cam profile with knife edge follower having an offset of 10 mm for the following data : Outstroke = 60° with SHM Dwell = 30° Return = 60° with uniform velocity and remaining is dwell period. Minimum radius of cam = 50 mm Lift of follower = 25 mm Consider the rotation of cam in clockwise direction. The follower during its travel may have one of the following motions. i) Trace point : It is a reference point on the follower and is used to generate the pitch curve. In case of knife edge follower, the knife edge represents the trace point and the pitch curve corresponds to the cam profile. 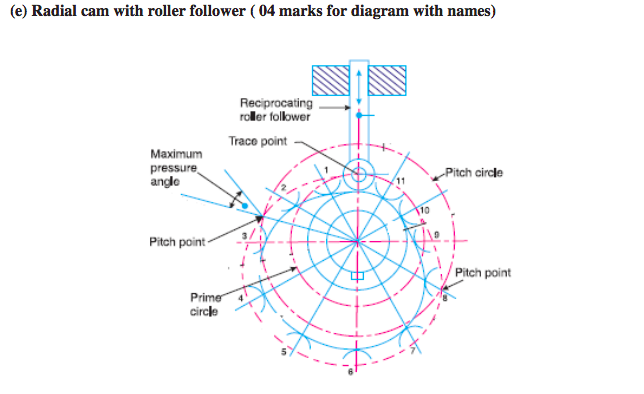 In a roller follower, the centre of the roller represents the trace point. ii) Pitch curve: It is the curve generated by the trace point as the follower moves relative to the cam. 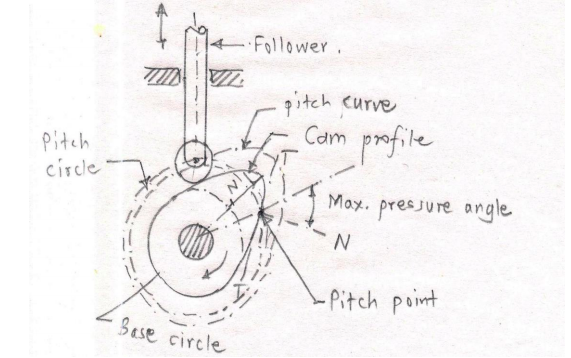 For a knife edge follower, the pitch curve and the cam profile are same whereas for a roller follower, they are separated by the radius of the roller. iii) Prime circle: It is the smallest circle that can be drawn from the centre of the cam and tangent to the pitch curve. For a knife edge and a flat face follower, the prime circle and the base circle are identical. For a roller follower, the prime circle is larger than the base circle by the radius of the roller. iv) Lift of stroke: It is the maximum travel of the follower from its lowest position to the topmost position. A cam is to give the following motion to a knife edged follower : (i) Outstroke during 60° of cam rotation. (ii) Dwell for the next 30° of cam rotation. (iii) Return stroke during next 60° of cam rotation. 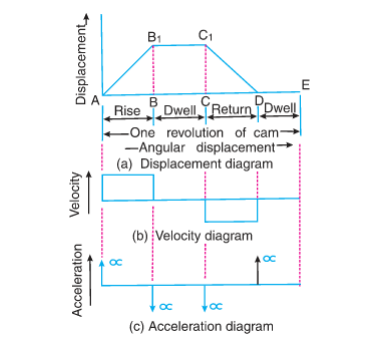 iv) Dwell for the remaining 210° of cam rotation. The stroke of the follower is 40 mm and the minimum radius of the cam is 50 mm. The follower moves with uniform velocity during both the outstroke and return stroke. Draw the profile of the cam when the axis of the follower passes through the axis of the camshaft.